Fellow first-year teacher Brian Battin is also putting students first. 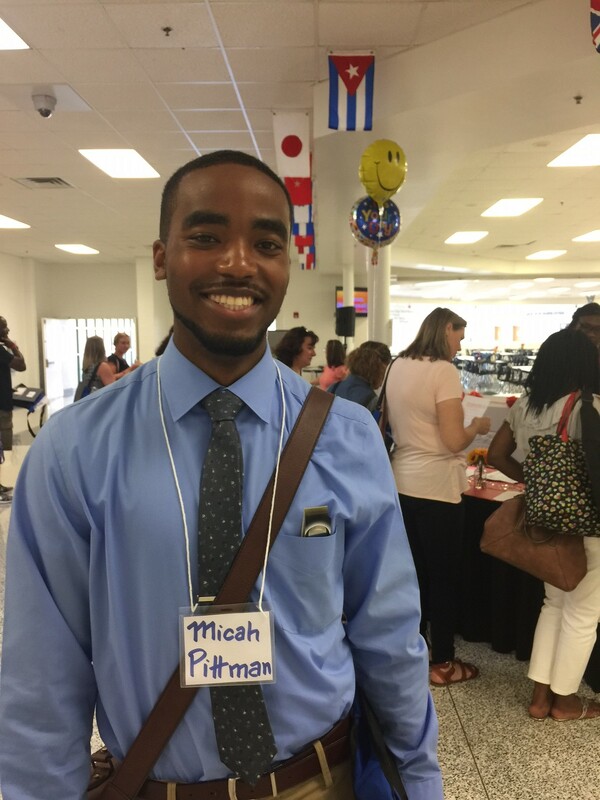 “My goal for the year is to get to know my students, first of all, and really create new experiences for them to learn math,” said Battin, who will be teaching mathematics at Princess Anne Middle School. 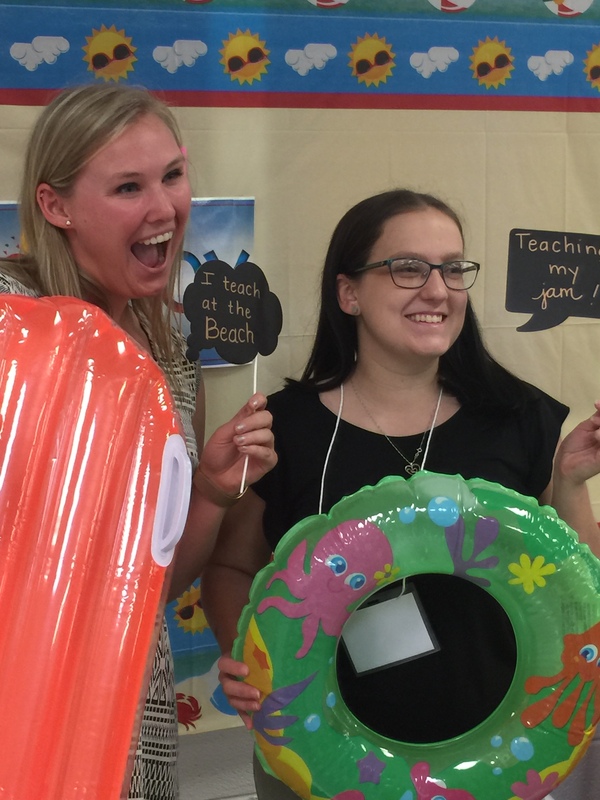 Pittman and Battin were just two of more than 450 new instructional staff members attending this year’s Teacher Orientation and Continuous Learning Institute (TOCLI), which was held Aug. 21-23 and organized by the Office of Professional Growth and Innovation (PGI). 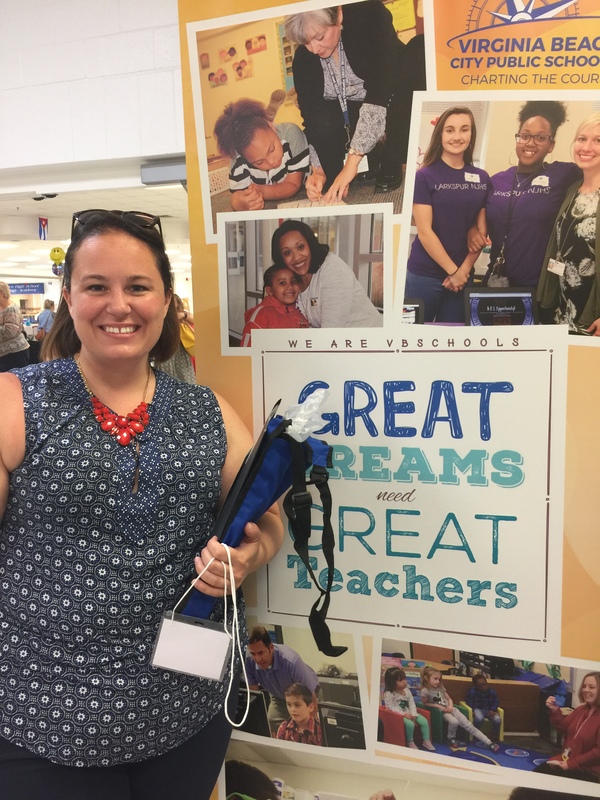 After spending Monday morning at their schools, all participants made their way to Landstown High School for TOCLI welcome events where they were greeted with enthusiastic cheers by the school’s cheerleaders while “Proud to Teach at the Beach” as well as “Great Dreams Need Great Teachers” signs lined the walkways. Past that first hallway, a photo booth and “Joy Station” were the first of many tables manned by staff members ready to provide teachers with information about the school division. After lunch, participants moved into the auditorium where School Board Chairwoman Beverly Anderson, Superintendent Aaron Spence and guest speakers officially welcomed everyone to Virginia Beach City Public Schools (VBCPS). During this time, participants were also introduced to the school division’s core values and strategic framework, Compass to 2020. Day Two was time to start diving into classes which, according to Gorham, were custom-tailored to meet the needs of each participant according to their teaching assignment and prior experience. 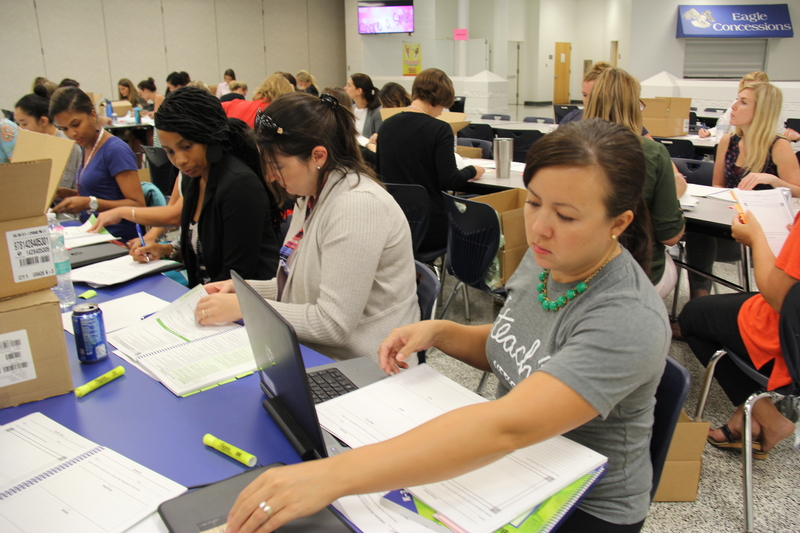 Amongst the many lists of classes were “Content and Math Overview” by grade level, “Comprehensive Literacy Model and Curriculum” by grade level and other classes specific to teaching assignments or subject areas. 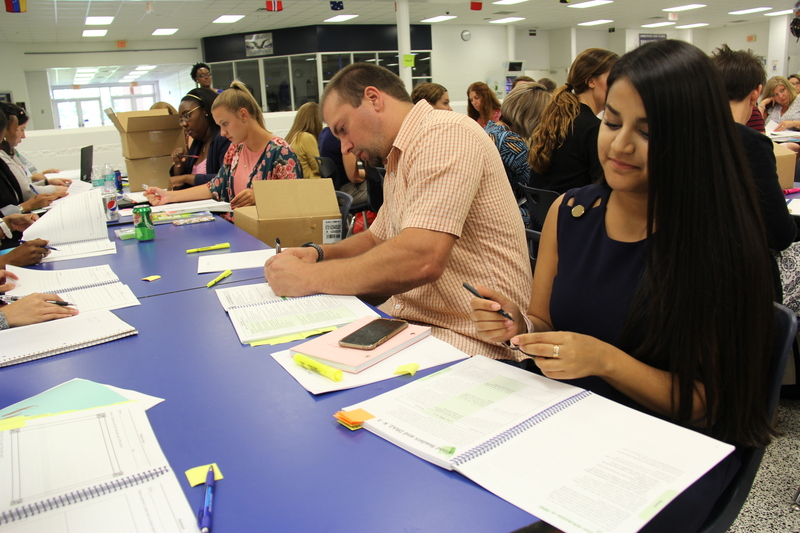 The Department of Teaching and Learning also provided differentiated sessions for elementary teachers who administer the Developmental Reading Assessment, or DRA. Even though creating positive learning environments for students was a theme that touched all sessions, there were also classes specifically for this topic because, according to Gorham, it is a big focus for the school division. One way the school division is emphasizing that positive learning environment is by getting to know students, which Superintendent Spence emphasized earlier this month at the welcome back event for all division leaders. He shared that same inspirational message at TOCLI. “It is my belief that if we have three things, we will be successful in making a difference in the lives of every child, every day. We need to have an effective principal in every building. We need to have an effective teacher in every classroom. That same message was echoed by 2018 Citywide Teacher of the Year Amanda Pontifex, fifth-grade teacher at Shelton Park Elementary School. “A great reminder that relationships matter” were a few of the comments heard around the room after their presentations. When asked what she thought about the three-day TOCLI event, Amanda Lantrip, a new teacher to the school division who taught 10 years in another school division and will now teach third grade at King’s Grant Elementary School, said that TOCLI was very informative and welcoming. I see Michelle Hollowell Chissler, Holland Elementary! !